In Episode 3 we moved into our new (old) and freshly painted house and now it’s time to start making it pretty! Since we don’t have a ton of furniture but I desperately want to start decorating, the mantle is the perfect place to start implementing our design scheme — that I laid out in the vibe tray in Episode 2. 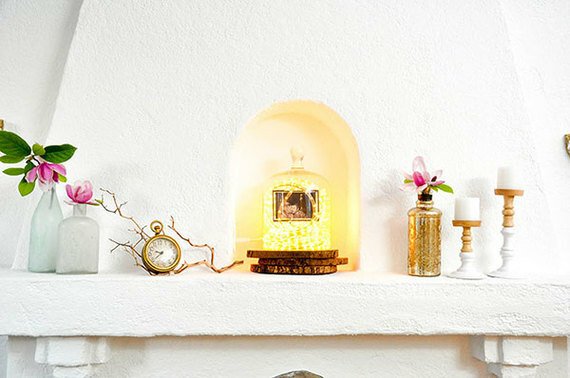 The inset alcove or altar, as we’re calling it, is just begging for a whimsical DIY project. 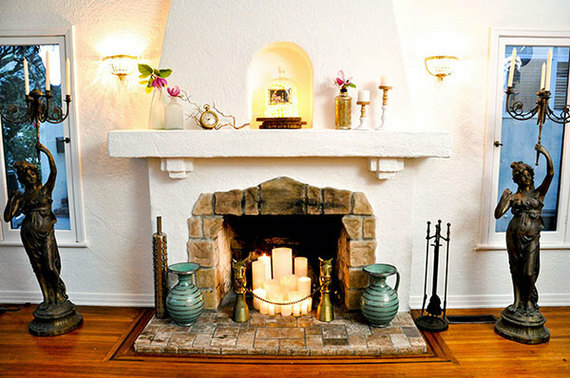 The mantle is the first thing you see when you walk in our front door so it’s the perfect place to establish the design for the overall house. Prep your space! I’m hanging the crystals on our newly installed sconces from Lamps Plus and Joey’s getting the fireplace ready for our candles. 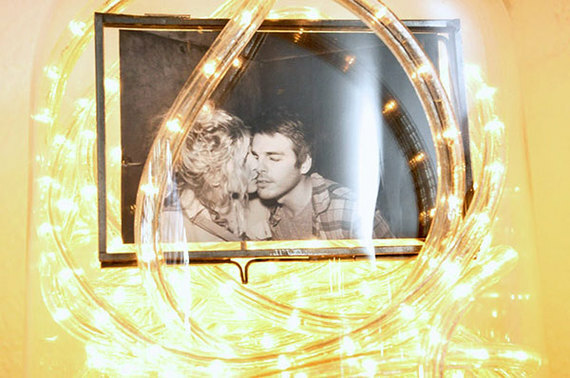 DIY Project: “The Light Of Our Love “ – I created this DIY project around the idea of the rope lights illuminating a photo of Joey and I and contained in a vintage-inspired bell (or cloche) jar. It fits perfectly in the little alcove/altar on our mantle. 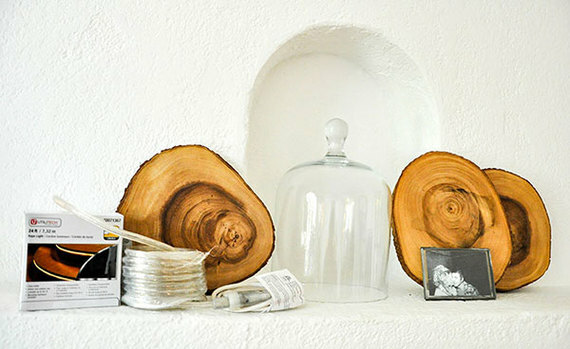 Coil the lights inside the bell jar and around your photo, place the bell jar on the stack of wood and plug it in! When decorating a room, give yourself a lot of different shapes, sizes, colors, and textures to work with – and dont ever be afraid to incorporate things from outside into your living environment! 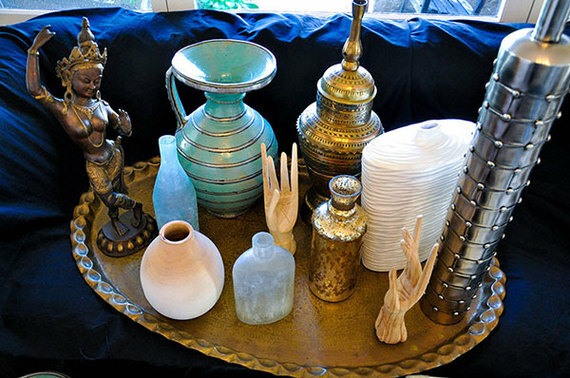 I always like to have more items than I need on hand when I’m styling a surface, mantle, shelf, etc. so that I can play around with the placement to achieve the perfect combination. It’s a fun process but give yourself the time to place and play, always stepping back every once in a while to take in the big picture. 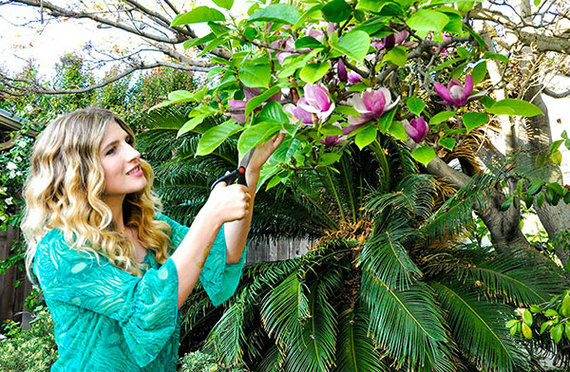 Fresh magnolias from our tree! Another really easy DIY that I came up with on the fly was to place a small clock amongst the tiny branches of a sandblasted manzanita branch (check your local craft store too) that I used to keep in a vase in our old bathroom… the effect is very Salvadore Dali! Our chimney needs to be fixed and the inspector advised us to not burn fires in the fireplace until it’s safely operable. So, in the meantime, the perfect solution is candles! I bought pillar candles at varying heights in both white and off white and arranged them in cascading order inside the fireplace. The Luminaries candles are a great budget friendly option so you don’t have to keep buying new candles and don’t have to deal with messy melted wax! The two Victorian candelabras are antiques that my mom gave me years ago – they’re such sassy ladies! Now all we need is to put down the rug!…and get some curtains… and some furniture… but I love how the mantle looks! Moroccan Poufs likes these, make great accent pieces and footstools and are lovely in any room. I went for a giant Tuscan Moroccan shag rug so we have some cozy plushness underfoot but the white with the diamond pattern keeps it chic! Please comment below and let us know what you’d like to see in the next video. There’s still a lot to be done! Previous articleOMG We Bought A House! Episode 5: Be Our Guest(Room)!